GEMINI contains an automated installation script which installs GEMINI along with required Python dependencies, third party software and data files. This installs the GEMINI executable as /usr/local/bin/gemini, other required third party dependencies in /usr/local/bin, and associated data files in /usr/local/share/gemini. Please note that this is merely an example: one can place the GEMINI executables and annotation files in any directories one wishes. The automated installtion script typically requires ~30 minutes, primarily owing to the time required to download the GEMINI genome annotation files. Also, please note that the annotation files requires ~15Gb of storage, so please ensure that the data directory (/usr/local/share/gemini in the example above) has sufficient space. Some older versions of wget have certificate problems with GitHub files. If you run into this problem, you can alternatively download the install script using``wget –no-check-certificates`` or curl -O. The installation script is idempotent and you can re-run it multiple times without any issues. If you experience internet connectivity or other transient errors during installation, a re-run can often solve the problem (fingers crossed). If you’re installing behind a proxy you’ll need to set proxy information in a condarc file and also set all_proxy, http_proxy and https_proxy in your .bashrc file. See this mailing list discussion for more information. 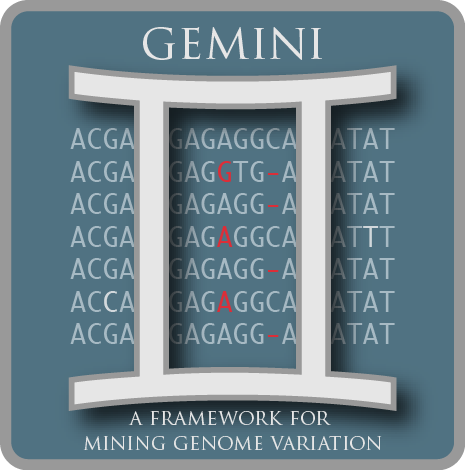 At this point, you will have a self-contained installation of GEMINI, including both the software and its associated genome annotations. However, if you have done a custom install in a “non-root” enviornment, you will first need to update your PATH environment variable to include the path to the bin directory that you just created by running the automated installer. Note that this change will only last for the life of your current terminal session. To make this more permanent, update your .bash_profile so that this change is made each time you login. One of the more appealing features in GEMINI is that it automatically annotates variants in a VCF file with several genome annotations. However, you must first install these data files on your system. It’s easy enough — you just need to run the following script and tell it in which full path you’d like to install the necessary data files. The recommended path is /usr/local/share, but you can install the data files wherever you want. Annotation files like GERP at base pair resolution and CADD scores are not part of this default installation owing to their large file size. They may however be installed as additional data files using the gemini update --dataonly option, with the flag --extra for gerp_bp and cadd_score. GEMINI comes with a full test suite to make sure that everything has installed correctly on your system. We strongly encourage you to run these tests.